The shredded gel dough clusters contained in this pillow serve to create a cool, customizable memory foam pillow. A memory foam sleeve encases the pillow, creating a uniformity of feel while allowing the pillow itself to be shaped and molded to better fit a sleeper's varying preferences. Unique memory foam known as Gel Dough creates a cool, comfortable feel. 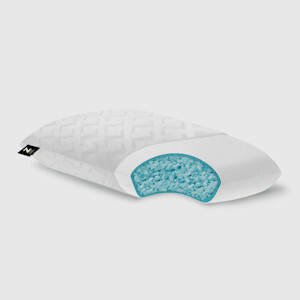 Combination of clustered Gel Dough memory foam and a solid foam sleeve creates a soft, malleable pillow. Soft, removable bamboo velour cover is both hypoallergenic and excellent for sensitive skin.